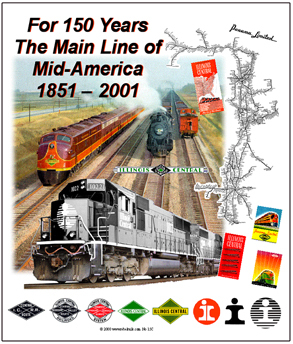 For 150 year the Main Line of Mid-America. 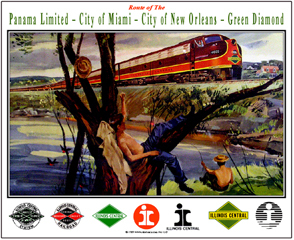 Operated the famous City of New Orleans, City of Miami and Green Diamond passenger trains. Now part of the CN Railway. Illinois Central E-unit passenger power heading up the City of New Orleans heading for its namesake city on the gulf, on a chocolate brown premium tee shirt. Illinois Central kept its passenger trains and equipment spotless right up to the end. Illinois Central Railroads City of New Orleans passenger trains rolling through dusk on its way from Chicago to New Orleans. Coffee Mug featuring the Illinois Central Railroads logo superimposed over the paint scheme of its diesel locomotives. A very unique way to present the railroads logo. 6 inch x 6 inch square tin logo sign of the Illinois Central Railroads 100th Anniversary medallion. 6 inch x 6 inch square tin 1857 logo sign used by the Illinois Central Railroad. 6 inch x 6 inch square tin logo sign of the Illinois Central Railroad final logo issued in 2001. 6 inch x 6 inch square tin sign of the logo used by the IC Railroad between 1923 and 1936. 6 inch x 6 inch square tin sign of the logo used by the IC Railroad between 1936 and 1950. 6 inch x 6 inch square tin sign of the Logo used by the IC Railroad between 1950 and 1966. 6 inch x 6 inch square tin sign of the Logo used by the IC Railroad between 1966 and 1972. 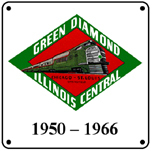 6 inch x 6 inch square tin logo sign of the Illinois Central Railroads famous Green Diamond throughout the late 1930's and throughout the 1940's. 6 inch x 6 inch square tin logo sign of a PIG image used by the Illinois Central Railroad in the 1960's. Pad features a night scene of the Illinois Central flagship passenger train, the City of New Orleans. 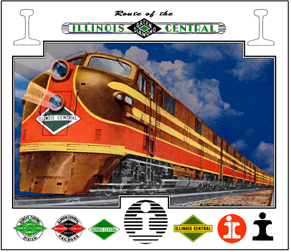 Collage of Illinois Central images celebrating the 150th and last year of service in 2001. 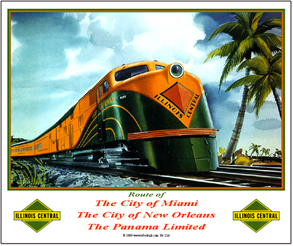 Illinois Central Railroads beautiful City of Miami streamlined passenger train in its as delivered paint scheme. This exclusive metal sign features the artwork of Daniel Edwards, with the detailing of engineering drawings. 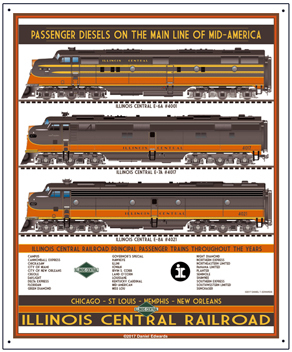 This sign illustrates the Illinois Central Railroads beautiful brown and orange passenger diesels; E6, E7 and E8. Nostalgic scene of the City of New Orleans with boys fishing as the famous train passes by on its way to its namesake city.